More information on digitised newspaper collections. Colorado’s Historic Newspaper Collection covers newspapers published in Colorado 1859-1923, an amazing 120 titles being available. 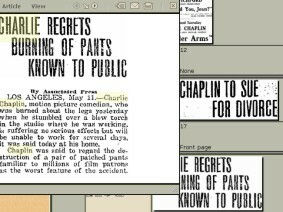 The site uses the ingenious Olive Software programmes has been adopted by a number of digitised newspaper collections. Just type in your search term, make sure to tick the box marked Search All Publications, then there are various options for refining your search query. Search result provide you with an image of the article in question, which you click to view full size. Results for silent cinema subjects vary. There is plenty to be found searching on Charlie Chaplin and Mary Pickford, precious little on D.W. Griffith or Kinemacolor. Note also that the site works best with Internet Explorer. Some other American historic newspaper sites out there (which are freely available) include Utah Digital Newspapers (1850-1950) and the Brooklyn Daily Eagle (1841-1902). Many more such collections are described in the earlier Times past post.